First up i was nominated to do the 3 Day Quote Challenge by my sweetheart bittersweetxbeauty! Please do check out her wonderful blog! Love you girl! 😘 I haven’t done this before so i’m excited about it! 1. Tag the blogger who nominated you. 2. Answer the questions you were given. 3. 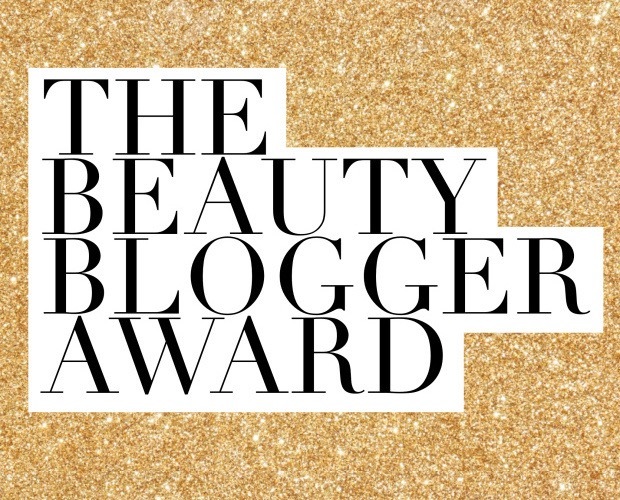 Nominate some people whose blog is about beauty or fashion. 4. Make 10 questions for your nominees to answer. 5. Inform the blogger you chose that you nominated them. What is your go to nail polish color? If you didn’t have to worry about money, what would you do with your life? I wouldn’t change much, besides my job. 👌😁 Maybe buy a house instead of renting LOL. What is your ultimate wish? My ultimate wish is to be truly happy, but of course that is something that needs to be worked on endlessly. Eyebrows on fleek or highlight on fleek? What is the most underrated makeup line? Would you ever create a youtube channel? The Walking Dead, Chopped, Cutthroat Kitchen, The Office.. As of rightnow haha. Does it take you under/over 15 minutes to get ready in the morning? Liquid lipsticks VS. Regular lipsticks? What makeup brand do you own most of? 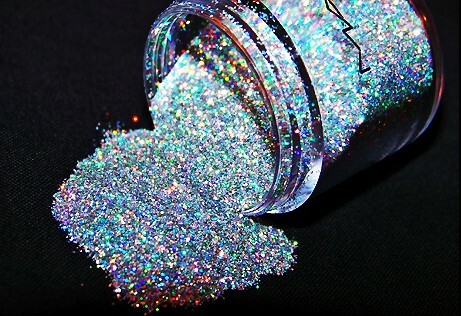 All time favorite makeup product? 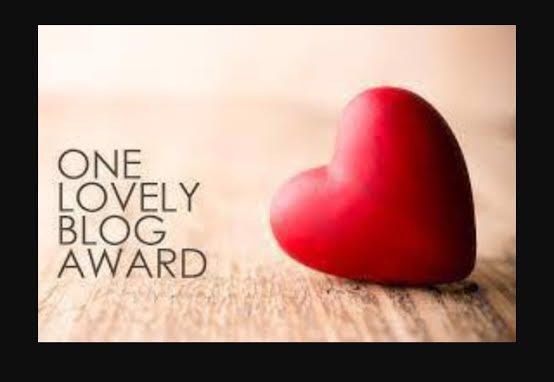 Nominate some other bloggers and comment on one of their recent posts to let them know they have been nominated. I live with my boyfriend and two fuzzy kitties in a wonderful community. When i was in middle school, there were strict rules on no makeup, no dying of hair, no originality of any sorts. “You all are supposed to look the same, to give the school a good name.” After that all hell broke loose, as you would expect, and i dyed my hair every color of the rainbow and wore heavy makeup, false lashes constantly. I was terrified of cats before i got my little angels 😇 Friends cats would hiss, scratch or bite me ALWAYS. I am mortified of the thought of being in the ocean if it is deeper than my knees. I almost drowned when i was 9-10. Horrible, horrible experience. I still have reoccuring nightmares of trying to escape giant waves. I am a very good cook & baker! 🍲🍰🍪🍕🍝 I would consider it another passion of mine. I used to be on a varisty basketball team, i could school anybody at a game of B Ball. Hahaha. Next up i was nominated for the Leibster Award once again, by the extremely talented, smart & oh so kind at heart Hari, from fiercepaint. 😁💓 This guy has one of my favorite beauty blogs, please do go give him your love & support and follow! Include the LIEBSTER AWARD sticker in the post too. 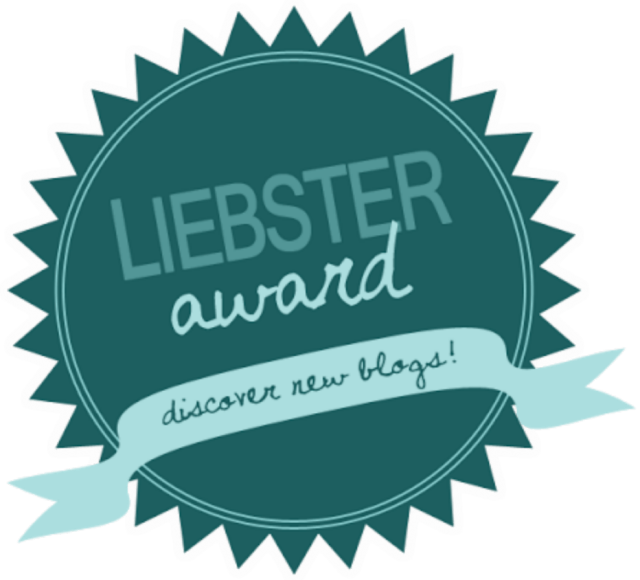 Nominate some other bloggers who you think are worthy of this award. Let them know they have been nominated by commenting on 1 of their posts. What is one bad habit you have kicked? 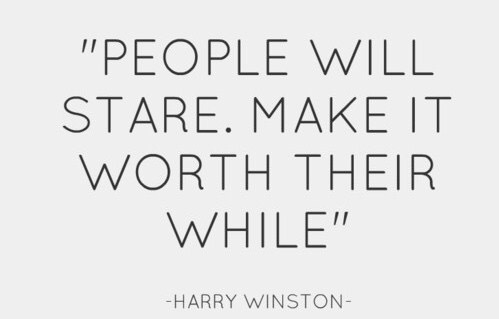 I would always get complaints about how i would give people dirty looks, i’m pretty positive it was just my face hahaha. But i haven’t heard that complaint in a while SOOO..
What is your single most vivid memory as a child? Being forced to pretend i’m someone i am truly not, being told to act certain ways and believe certain things and shun people who were different, in terms of education. Not my family life. What are some of your thoughts on social media; answer it in a sentence of no more than 15 words. It makes people a little crazy haha..
What is your most sentimental and prized tangible possession (please guys don’t pick the obvious, that means no house, car, laptop, phone etc.!)? What is your idea of an ideal day? Share one random general fact/trivia you know (from the top of your head) without searching for it from a source of information. Who is your favourite FRIENDS character (if you don’t know the show, favourite How I Met Your Mother character). If don’t watch either, what is your favourite series to watch. If you don’t watch any, favourite book. My favorite book is The Jungle by Upton Sinclair. What is your one current obsession? 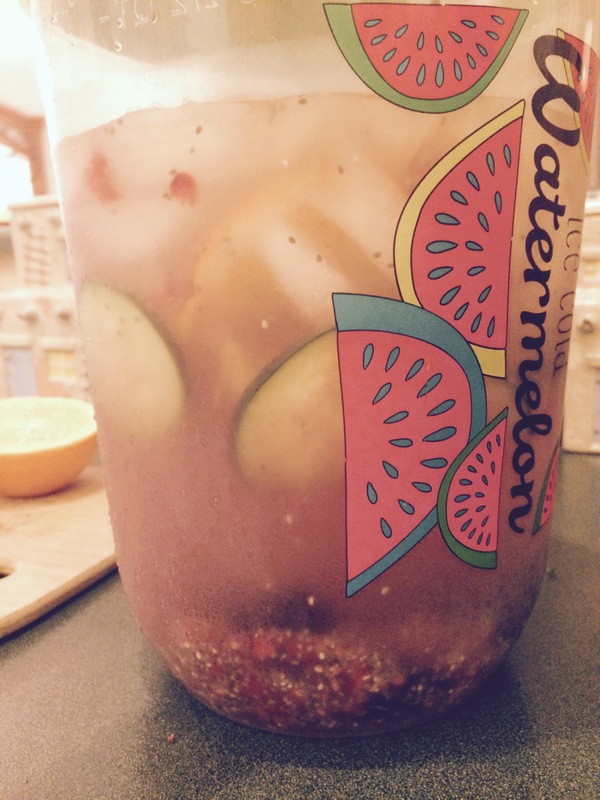 Detox waters! 👍 & Trying out different forms of eyeliners. On to the makeup questions, share one beauty tip/hack fail that you have experienced. If you don’t have one, then just one bad experience you have had with makeup. Mascara, eyeliner, eyebrow product (any kind), blusher, lipstick (any kind). Pick one from this list and your reason for picking it. Mascara because it will liven up your face without any other products. Make you a bit more appealing/feminine in my opinion. Are you closer to: mother, father, or siblings? One ebarassing event you can recall from the top of your head? Were you popular or an introvert in Highschool? If you could posses any type of animal as a pet, without any risk of it attacking you, what would you chose? Fake nails VS. Natural nails? When did you start blogging? Do you remember any of your first post’s topics? 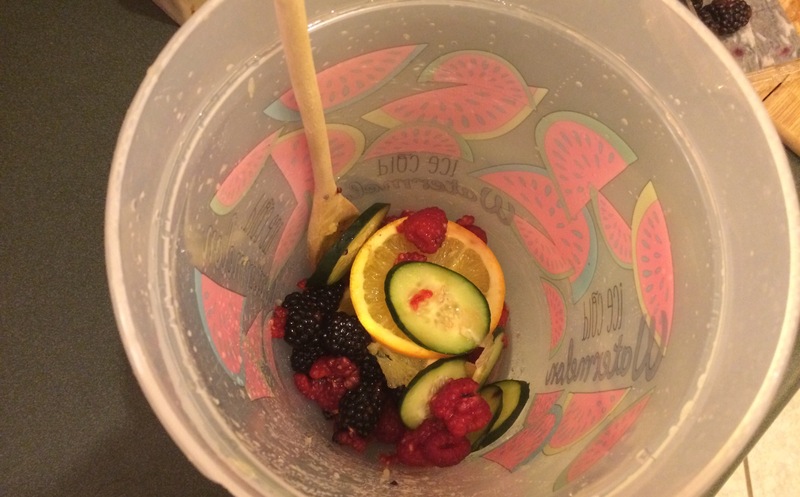 Now for my super good, super easy detox water recipe! This is SO simple anyone can do it! 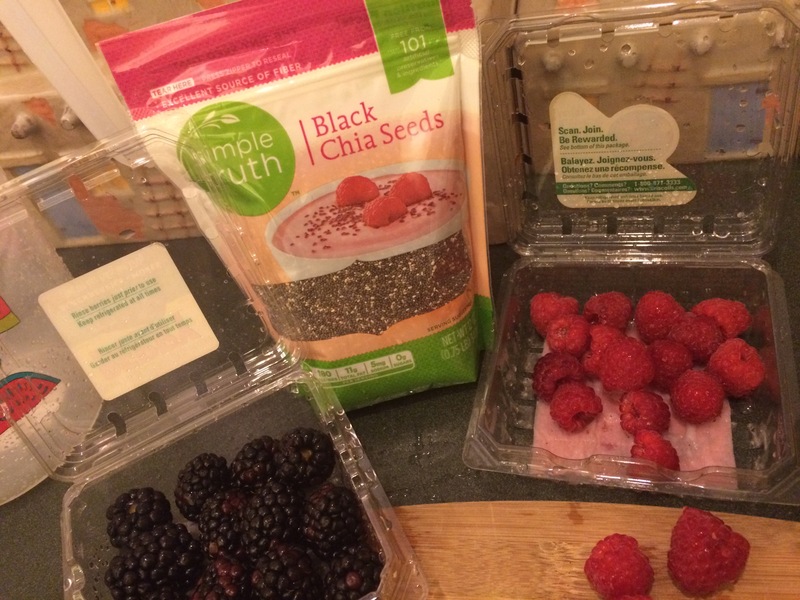 Chia is loaded with antioxidants and nutrients without being loaded with calories. 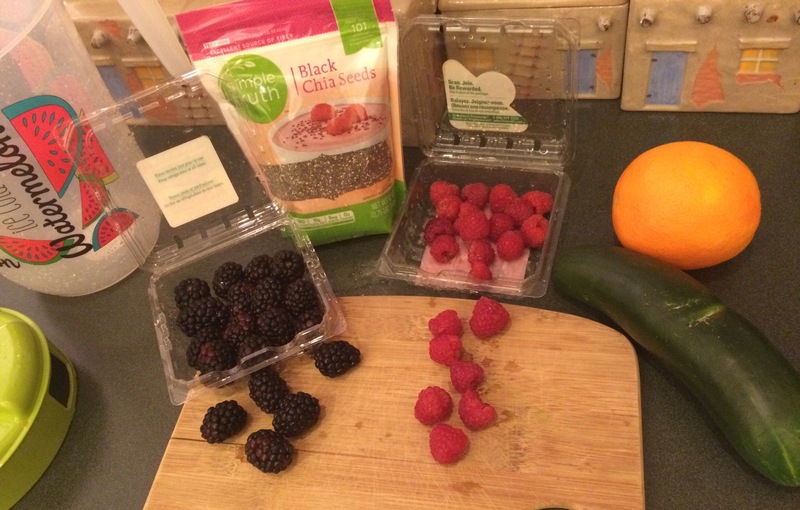 Almost all of the carbs in them are actually fiber, and they can actually help you lose weight. 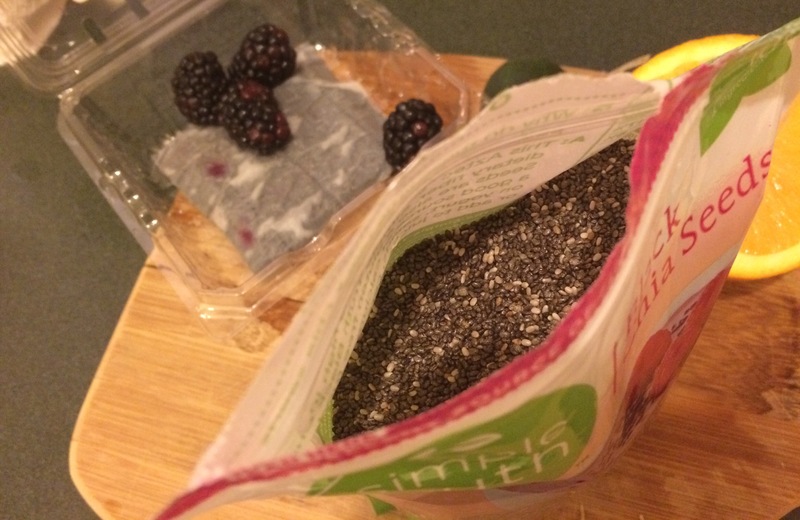 They can be added to any type of drink, smoothies, cereal, oats, salads and more. This bag cost me $4.00 and will last me an extremely long time since you use small amounts. 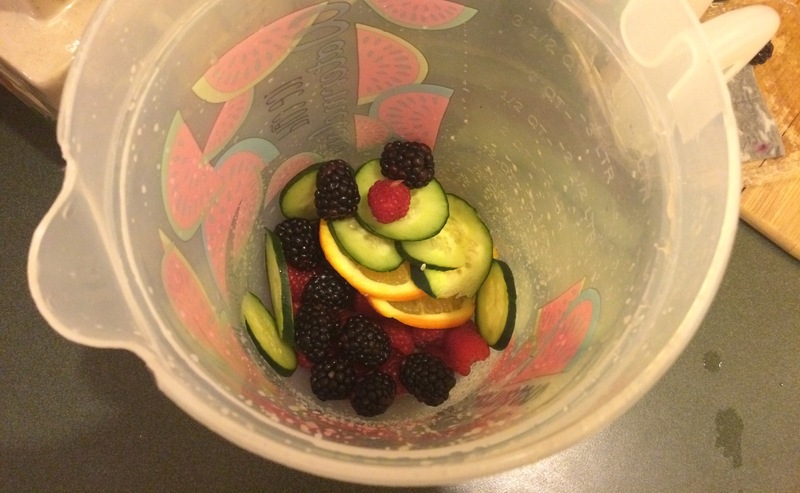 I started off by throwing in Raspberries, blackberries and thinly sliced orange and cucumber in my pitcher. I used a little less than half the cucumber, and i sliced up half the orange and squeezed the other halfs’ juice into the pitcher. Then i slightly muddled (squished) the ingredients with a long wooden spoon. Crushing up almost all of the rasberries but leaving the other fruits in tact and beautiful. 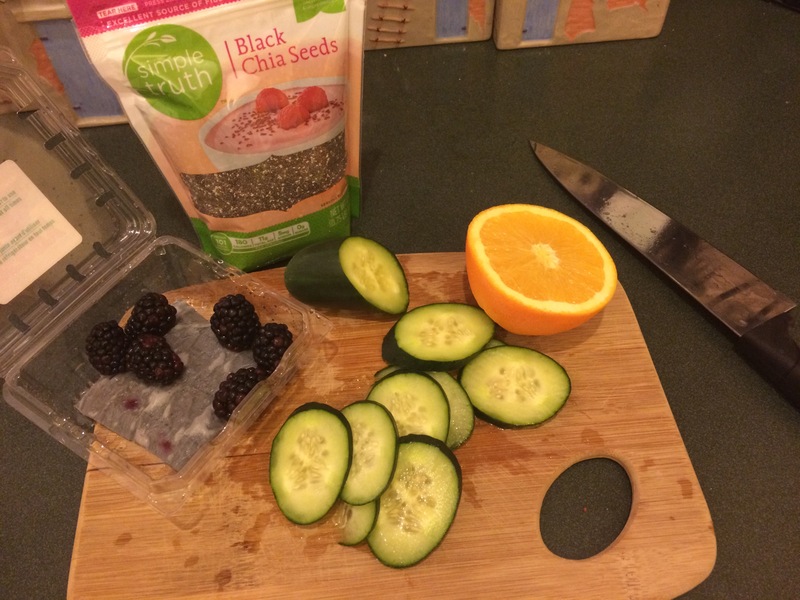 After that step, it’s time to add your Chia Seeds. I used 2 tablespoons. 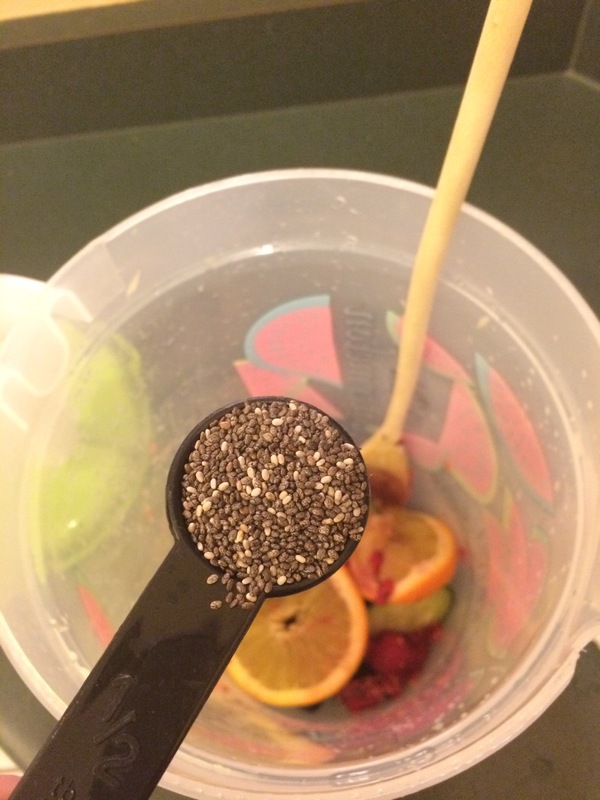 Toss them in ontop of your fruit and use your spoon to mix things up. 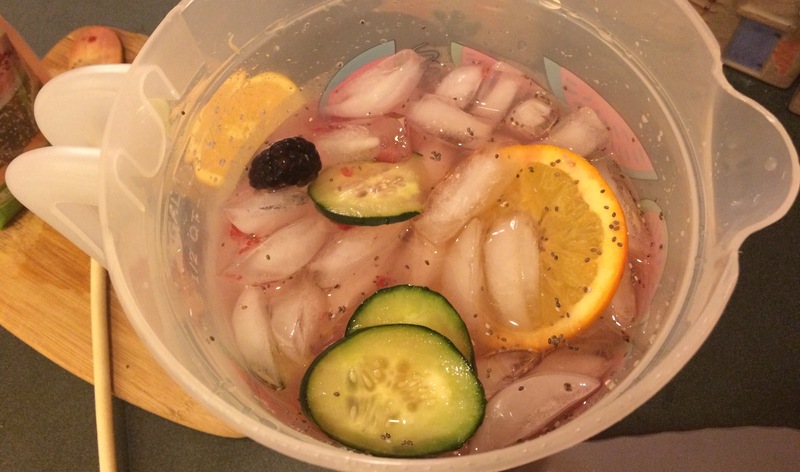 Then put a load of ice ontop your fruit, followed by a can of coco water and regular ice water. Mix mix mix!